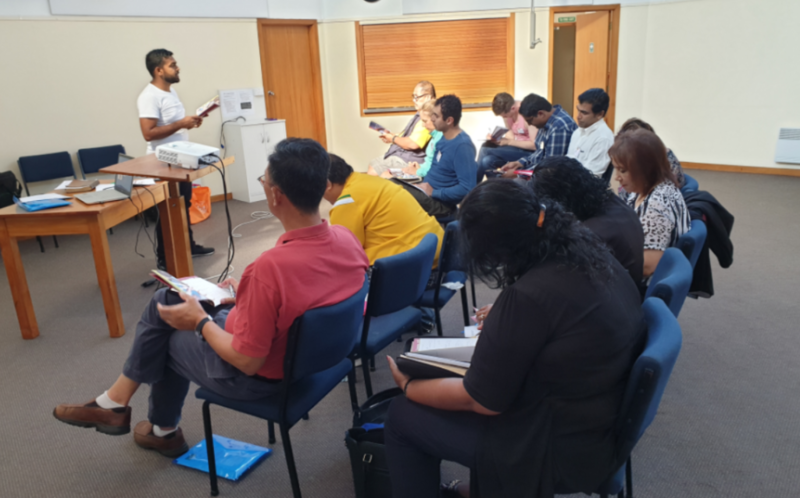 In March we ran our first SYF (Share Your Faith) training for 2019 at Greenlane Presbyterian church attended by 10 different churches. It was a one-day workshop, followed by 7-week EV2 (Everyday Evangelism) training. Anne, Raj Kashyap and I had the privilege to teach and equip 12 people in total. I also had an opportunity to be part of a gospel outreach organised by C3 church in Howick. 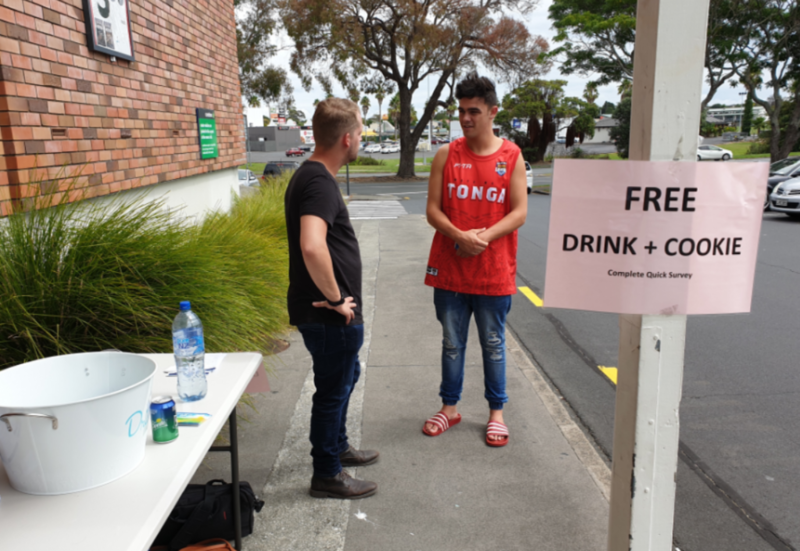 We gave out free drinks and cookies outside a mall and attracted mostly young adults, who were searching for their purpose in life. We shared and connected with about 30 people and three young adults gave their life to Christ on that day. The C3 Howick church has invited them to their church, where they will be discipled and nurtured. One of the young men lives in the city but happened to be in Howick to visit his friend. Little did he know that it was the appointed time for him to make a decision for Christ. He came face to face with our living God, Jesus Christ and knew in his heart that this is the right thing to do. He looked overwhelmed, convicted by the Holy Spirit and thanked us for the experience and encounter with Jesus. Below is a photo of one of our team members outside the mall. Our AGM is coming up on Sunday 5 May. Wow ! One year has passed so quickly. Diarise and do attend – it will be hosted at St Paul’s Presbyterian Church, starting at 3pm followed by our Supporters’ Dinner. The address is 223, Weymouth Road, Manurewa and there is heaps of parking. Please RSVP to office@ee.org.nz by 29th April 2019. Two highlights last month were eight days in the Solomon Islands, followed by teaching in the Share Your Faith Training Workshop at Greenlane, with ‘the two Raj’s’. It’s a joy to still be active in teaching and training EE at home, thus keeping ‘my feet on the ground’. The Solomon Islands are known there as “The Hapi Isles”; this description features on every vehicle number plate. This is certainly borne out when you walk down the street by the smiles and number of times people say, “Hello, what’s your name?” It is an easy place to strike up a conversation and people everywhere are open to the Gospel. Unlike here in New Zealand, the newspapers feature articles on the Christian faith and MPs still write articles about honouring our God of the Bible. EE has been established in the Solomon Islands over the past ten years through the pioneering ministry of Rusi and Sai Tulaga, a Fijian couple, who with their four children went out with the support of EE Fiji. Now from the Solomon Islands’ base, they have developed EE in the Marshall Islands and are living in Majuro, its capital. Pastor Ross Masika, previously Chairman of EE Solomon Islands, is transferring to be the new National Director. I greatly enjoyed spending almost every morning with Ross as we discussed the key aspects of further developing EE training and implementation there. Ross has a fine ‘track record’ of training leaders of all ages in his Joy Harvest Church (what a neat name that is!) Please pray for Ross and the EE Board there, as they face the huge challenge of contact and communication over nine island provinces so costly and even dangerous to reach. Even greater is the challenge of raising cash in this low wage economy. As well, storms can easily destroy what has been built. Nevertheless, the outlook is very promising with a new enthusiastic leadership team training church members and implementing EE in such a Gospel open society. Praise the Lord! We have entered into the final month of 2018. How fast this year has passed. We are now heading towards the season of celebrating Christmas and remembering the great love of our Father in heaven, who gave His Son Jesus Christ as a gift for us, a gift of salvation and redemption. I hope that during this time of holiday and celebration, you will take a moment to reflect all that you have achieved this year and give thanks to God Almighty for giving you the wisdom, knowledge and favour to accomplish them. 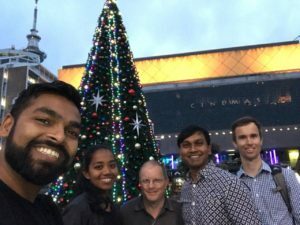 In the same way, I have done a reflection on the achievement of EENZ ministry this year and am happy to share with you that it has been another great year for EENZ, seeing great successes in adult workshops, implementations, OJTs, conference participation and an increase in ministry partnerships. Our 2018 results show that we have completed 20 workshops in total for the year, with 270 people trained, 53 churches attended, 266 people heard the gospel and 117 made Jesus their personal Saviour. Needless to mention the many hundreds who are saved apart from the workshops. This awesome success is largely attributed to God’s hand upon our ministry and the great commitment from EE staff, our volunteers, intercessors and prayer warriors, responding to the opportunities that God presents for us to equip churches and share the Gospel with those who are yet to hear the good news of Jesus Christ. This year we also formed a brand-new EE ministry chat group called “Fishers of people” in WhatsApp social media application. These are people who have been recently trained in EE ministry and we actively use this chat group to communicate and build relationships with one another. We encourage one another, pray for the needs of the members, organise weekly/bi-weekly witnessing, motivate each other with devotions and share learnings from our witnessing and teaching. We have 26 participants at present and I foresee this group to grow bigger and bigger next year. On other note, this year we have put considerable effort into training and equipping the Cook Island churches in EE, especially the CICC church, and this is bearing fruit as many trained members are now faithfully doing weekly visits to various homes and sharing the gospel with families and friends. Many people are being saved each week. All glory to Jesus. And not only that, they are preparing to become the next island in the Oceania region to become an EE Multiplying Nation at the 2019 Congress in Albania. We are hopeful that by February 2019, the Cooks would have selected a National Director, a Chairman, a treasurer and committee members. When we look back, it is amazing progress, seeing how EE started in the Cook Islands in 2003 at an embryonic stage, but is now achieving full maturity. God’s hand is definitely in the Cook Islands. I, together with the entire EE team here, would like to wish you a fabulous Christmas and happy holidays. May the Lord bless you and keep you well during this festive season. I’m looking forward to 2019 and to see you in the New Year. As I reflect on the year past, I am so thankful for the servants of God I’ve met or re-met on eleven trips to the nations of Oceania. While there are still challenges and much work to be done, I am encouraged by the progress on many fronts. 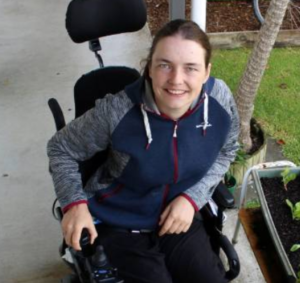 Standouts include the relationships between nations forged at the Oceania Conference in August, EE-experienced, well qualified Board members being elected who are transforming direction in two nations, and a marked increase in EE training, particularly with implementation right across the region. I am impressed by the calibre of our Board Chairman and the vital part they play in direction and negotiation through staff issues. In early November, I visited Vanuatu and once again enjoyed being with such friendly, gentle and hospitable people. One can walk around Port Vila and feeling welcome and safe. Every now and then, I read the biography of a pioneer missionary and just now, it is of John G. Paton, a Scottish missionary, who with his nineteen year old wife, went to Vanuatu (the New Hebrides as it was then) in 1858. Most of his predecessors, including John Williams, had been massacred and some eaten. It was described to be ‘a dark land’. By the time Paton left, the light of the gospel of Jesus Christ, had transformed the majority of the people so he could write of the island of Aniwa, “Aniwa was to be the land wherein my past toil and patience and faith were to see their fruit ripening at length. I claimed Aiwa for Jesus, and by the grace of God Aniwa now worships at the Saviour’s feet.” We must never forget that only Jesus can transform the life of a person and a nation. This conviction drives us on in EE! What motivates pioneer missionaries who were, and still are willing to risk their lives and families in the cause of the gospel? Clearly it was the absolute belief that without Jesus all people are lost. Hudson Taylor was compelled to go to China, telling his listeners at a meeting about the “great Niagara of souls passing into the dark in China”. Are we too comfortable in our churches forgetting the destiny of the lost? At Christmas we have a special, annual opportunity to ask a person, “Why do you think Jesus came into the world?” That can lead right into what the Saviour himself said, “For the Son of Man came to seek the and save the lost.” (Luke 19:10). We’re also reminded that, “The reason the Son of God appeared was to destroy the devil’s work.” (1 John 3:8b) May God bless you and your families as you celebrate Christmas and enjoy a holiday – but please don’t take a break from sharing the Good News of Jesus! I have just completed 8 sessions of Kids’ Connect for the term, to which God brought along 7-year-old Hindu twin boys. One was particularly attentive to the gospel and I hope to have contact with the family in the school term holidays. Another Hindu mum, whose daughter used to come two years back to Kid’s Connect, phoned me for a chat this week. I bumped into her again at Countdown with Siyona – this is a good reminder from God that I need to keep up the friendship with her. I had a wonderful gospel opportunity to keep sowing the seed and sharing God’s love with her. I am reminded of Galatians 6:9 “Let us not become weary in doing good, for at the proper time, we will reap a harvest if we do not give up”. Adrienne van Rij, EE Coordinator, Christchurch.